Recent decades have evidenced tremendous literature in the extraordinary benefits of meditation. Mindfulness meditation is often defined as practicing a nonjudgmental stance towards present moment experiences . Meditation can be thought of as a kind of mental training that strengthens and maintains critical cognitive functions for psychological and physiological well-being  . As such, mindfulness meditation has been introduced into spaces of work and learning. Specifically, educators in primary school systems are especially interested in integrating mindfulness meditation into their curriculum. Similarly, recent years have seen a tremendous upward trend in research using virtual reality (VR) technology to study, to understand, and to advance research in human development, cognition, learning, memory, psychology, and education  . 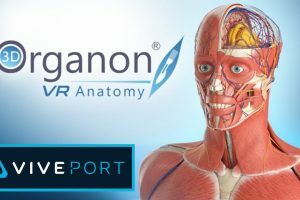 VR technology has a unique ability to captivate, immerse, and powerfully engage the user with its contents in the present moment. With the need to focus during meditation and VR’s affordance of simulating a sense of presence and eliciting visceral emotional responses, we hypothesize that VR can be an effective tool that supports the process of practicing meditation. In 2007, a landmark study  was conducted in which they found that ‘relaxing’ versus ‘anxious’ virtual environments produced relaxation or anxiety states, accordingly. More so, the effect of a relaxing environment increased quietness and happiness, and reduced negative affect, such as anger, sadness, and anxiety. Conversely, the effect of an anxious environment increased sadness and anxiety and reduced happiness and positive affect. A neutral environment produced no significant changes. This study is significant, because it suggests the use of VR as an affective medium. An affective medium is defined as a technological medium able to elicit different emotions through the interaction with its contents  . Furthermore, the study found that the feeling of ‘presence’ was greater in emotional environments and that people’s emotional state is influenced by the level of presence. This suggests an interaction between presence and emotion—two fundamental constructs in both VR and mindfulness research. In an age that values immersive classroom learning, there is a need for new technology to teach a variety of skills to students. Beyond learning content, students benefit from learning 21st century skills such as emotion regulation, resilience, and mindfulness . Among existing immersive technologies, there are a variety of virtual reality meditation programs that can be used by teachers in the classroom to help teach these ‘soft skills’ to 21st century students. Using different technologies, there are a variety of companies that produce immersive simulations of meditation that teachers can use including: Guided Meditation VR on the Oculus Rift and on the HTC Vive, Guiding Star VR Meditation for Android devices, Serene and Tranquil Reality for iPhone devices. 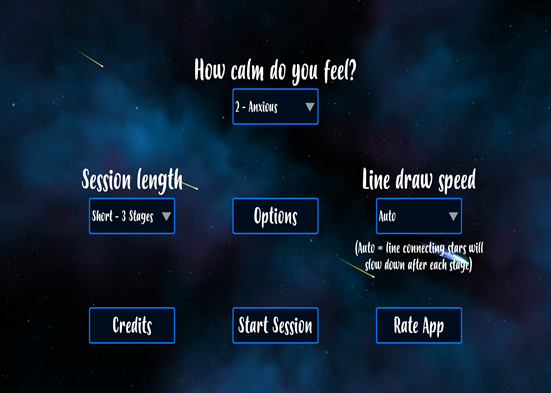 In the Guiding Star VR Meditation app (below), users are able to customize their practice based on their current emotional state from very calm to neutral to very anxious. The length of the meditation exercise is also customizable between 3 stages and 5 stages. The auto draw speed refers to the speed at which users may trace a pathway with their gaze from one star to another. Stars fall across the night sky in a random pattern and the users are instructed to synchronize their head movement and gaze in order to create a line between the stars, see below. If at any moment the gaze or head movements are not aligned, the line stops progressing until the gaze and head movements are once again lined up. This takes more concentration than it sounds! Other than feeling a little frustrated in the beginning while I was coordinating my head movement and gaze, resulting in the line’s progression stopping and starting, I really found the experience to be immersive and relaxing by the end of the demonstration. The app requires users to be present in the moment, focused on the task, which helped a novice meditator like myself. In other apps where there isn’t a movement-oriented task, the interaction between user and device becomes less clearly defined. 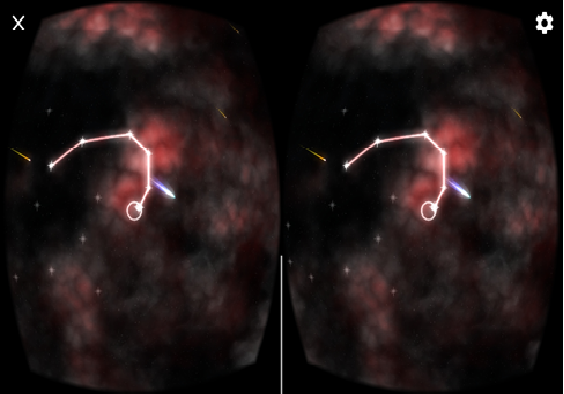 For instance, in the Guided Meditation VR application for the Oculus and HTC Vive, the guiding voice tells the user to close their eyes, see below. While this is common in meditative practices, it may seem counterintuitive to users who signed up for a VR meditative experience. 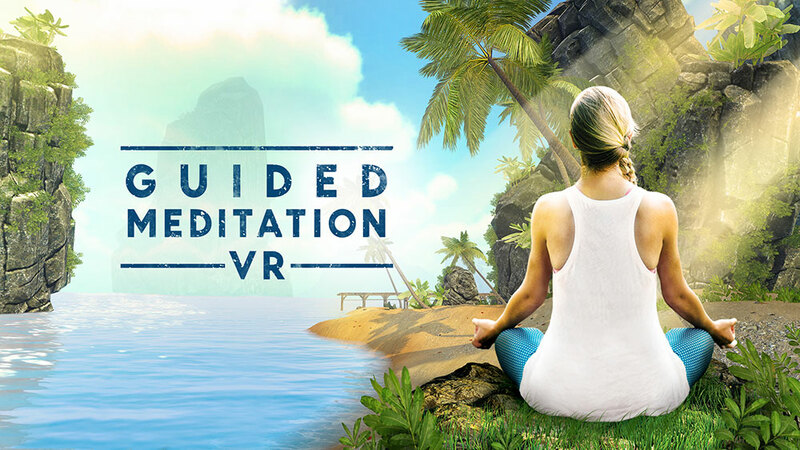 The graphics in the Guided Meditation VR app were vivid and required a high powered machine to interact with the application seamlessly. Overall, these applications may be useful in classroom management given that the user sits quietly without any dramatic bodily movements. 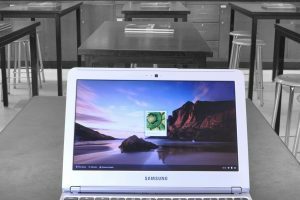 Any students that are having a hard time focusing or are off-task could possibly benefit from a 2 to 5-minute VR meditation experience. Additionally, there is an auditory component, so it could help muffle or drown out the noises in the classroom allowing students to focus on the meditative exercise. 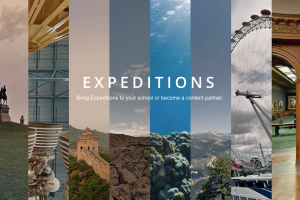 The only downside of this app is possibly incentivizing bad behavior because VR might be novel for some students. Tranquil Reality, see above, is a VR meditation app for iPhones, allowing users to explore different environments. 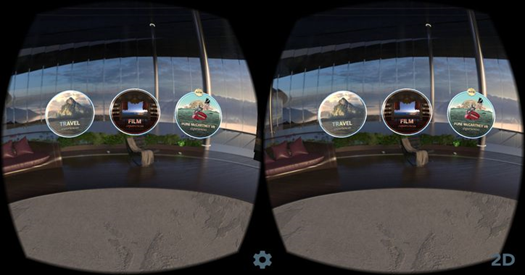 With a 360-degree view, users are able to choose from a variety of scenes to help escape from the real world into a VR world, to better concentrate on meditation. 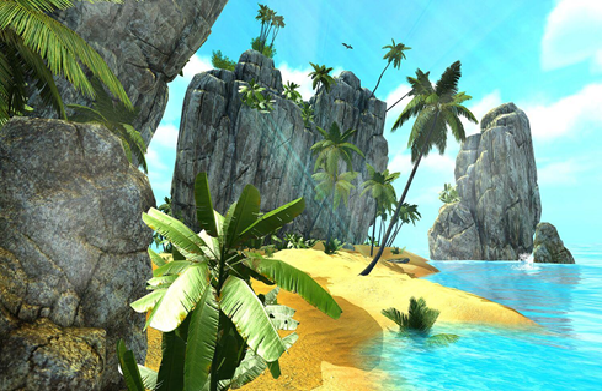 Users have the option of choosing to explore the scenes in using a cardboard or full screen mode. 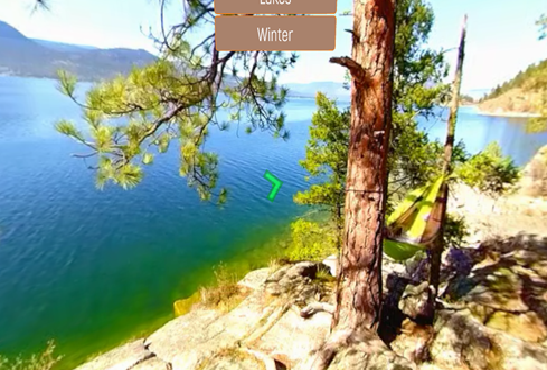 Serene, a VR meditation app for iPhones, allows users to choose a nature scene to meditate in with the tap of a finger, see above. The user has a total of 13 scenes to choose from including a forest, beach, pond, mountains, and butterfly garden. The app does not include a guided meditation, but background noise accompanies the visual scene accordingly. Users can meditate for as long as they want and are encouraged to try out full screen or cardboard mode. In an informal study conducted at a nearby private university, a small sample of students participated in a brief virtual reality meditation activity. While some participants experienced an immersive, high quality VR meditation (the Guided Meditation VR app on the Oculus/HTC Vive), others experienced a more affordable and accessible VR meditation using Google Cardboard (the Guiding Star VR Meditation, Serene, Tranquil Reality apps). Self-reported results indicated that positive and negative affect were neutralized by the VR meditation activity. This means that those who began with negative emotions became less negative but also that those who began with positive emotions became less positive. Also, while there was no significant difference between type of VR, on average, participants that experienced the VR meditation with the Google Cardboard reported higher positive affect and lower negative affect than those in the Oculus/HTC Vive group. Again, this was an informal study so take these results with some caution. Following the brief VR meditation activity, participants completed a reflection worksheet. Many participants remarked that the experience was generally relaxing with a few stating that the experience was “confusing” and “disorienting”. Some respondents reported feeling “tired” prior to the experience and reflected that they felt both “energized” and “relaxed” following the meditation. Despite anecdotal reports of improved affect, there were a couple participants that felt the experience was lacking. For instance, some people that experienced the Google Cardboard found the activity made them physically uncomfortable compared to those that experienced the Oculus/HTC Vive. Similarly, more of the people from the Oculus/HTC Vivegroup reported feeling confused during the VR meditation activity. While the study was conducted on a small sample within one classroom, these mixed results suggest that virtual reality meditation seems to have an influence on students’ affective state. While the exercise was brief, and results varied between participants, experiencing VR meditation seems to have an interesting relationship with the way students think and feel. Although some students found it rewarding others found it challenging. The existing literature strongly suggests that mindfulness meditation exercises are a tool that can improve focus, emotion regulation, and resilience that educators can use in the classroom . In a century where ‘soft skills’ such as these are predictive of success both in learning and work environments, VR meditation has the potential to make a great impact on students inside and outside the classroom. While the results from the classroom study indicate a neutralizing effect on both positive and negative affect, contrary to the results found by Riva et al. (2007), both studies demonstrate that people’s affective state is influenced by VR meditation experiences. Where the field is at now, it is too soon to say whether or not VR can and should replace traditional methods of mindfulness meditation. However, research suggests that there is a change in affect following simulated VR meditation experiences. It would be advantageous for further studies to explore the interaction between VR technology, positive and negative affect, and meditation in the classroom over an extended time.